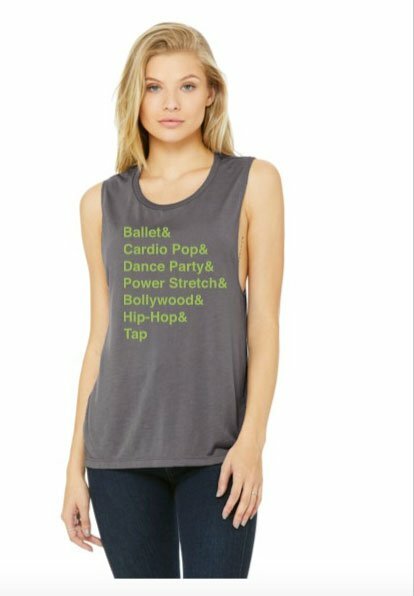 Step up your dance fitness game with a little extra swag! Just in time for summer, we’ve got a brand new line of super-soft tanks, tees, comfortable shorts and stylish leggings so you can look even more fabulous while you sweat it out. Plus, these designs are cute enough to wear out of the studio and off to the rest of your day. Get ’em while you can — since we’re testing out several new styles, we’ve only got a limited quantity in stock! Read on for details or head right to our online store to order. Members, don’t forget that you automatically get 20% off merchandise! For ballet fans who prefer a sleeveless style, stay cool and comfortable while you pirouette across the studio floor in one of these lightweight black tanks. If you love our classes as much as we hope you do, then this “best of” shirt is a must-have. Green Helvetica text highlights many of our class styles across the front of this dark gray tee. Try the tank version of our Helvetica shirt and show off the impact that all those classes can have on your toned arms. Ready to show the world your dedication to the art of hip hop? You won’t find a shirt *hipper* than this. The sleeveless version of our hot new hip-hop design. This “storm gray” tank features low-cut armholes and a curved bottom hem, creating just the right combination of femininity and swag. Silhouetted dancers in this design show off the range of styles you can find at our classes, from jazz to hip-hop. Green and white print on black. Jazz, hip hop, ballet, contemporary and cardio dance styles all get representation in the tank version of this design, featuring silhouetted dancers on a soft, lightweight fabric. Get noticed in these funky, high-waisted mesh leggings! The lightweight, breathable fabric makes them perfect for an intense workout, but they’re also stylish enough to wear out and about. Featuring a metallic silver dancer embellishment on the ankle. Stay cool with these booty shorts that will hug you in all the right places and give you the flexibility to do just about anything our classes might throw at you. 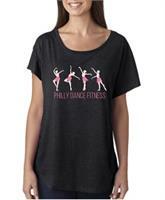 Also featuring our Philly Dance Fitness icon, imprinted in metallic silver on the thigh. Soft and comfortable for dancing or everyday wear, featuring silver or gold metallic printing on the front. Black (available with silver or gold metallic), Scarlet (gold print); and Purple, Turquoise and Raspberry Pink (with silver metallic). Made of 60% combed ringspun cotton/40% polyester lightweight jersey. Dancers shimmy up the side of this ultra-soft Next Level scoop neck tank top. The extra-long length and flowy material make it perfect for a dance workout. Available in Green, Purple, Marbled Plum, Vintage Navy and Vintage Black. Whether you’re a dancer, yogi, dance fitness junkie or you just like cute headbands, we’ve got the perfect one to keep sweat out of your eyes while you work out. Made of stretchy, machine-washable fabric. Comes in individual shrink-wrapped packages. After purchasing a product online, simply email us to coordinate which studio you’ll be headed to next so we can make sure to have your item waiting for you. Or, select the “shipping” option and we’ll mail it to you ($4.25 for any U.S. addresses). Take It Off: Burlesque Battle!